A possibly homogeneous and sufficient grip of the road is very important for traffic safety, in highway maintenance and in road construction. The pavement grip can be measured with the portable SRT (also known as the "Pendulum Tester"), which checks the resistance to skidding of wet road surfaces. A preliminary experiment was performed to assess if it is feasible to measure with the IR-camera the increment of temperature generated by the friction during the SRT test. Specimens of epoxy resin, diabase, limestone and porphyry were examined. The IR-camera allowed visualising the typical thermal signatures of the specimens and visually perceiving the pavement grip. The temperature rises supplied information on the distribution and intensity of the pressure in the contact area. 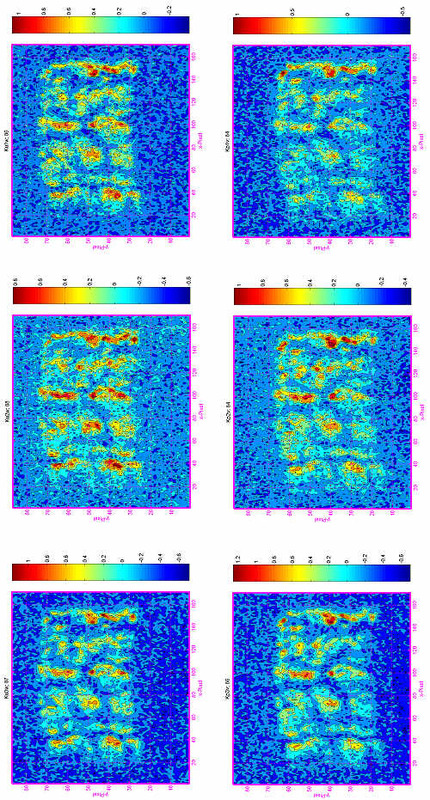 The combination of the SRT with the IR-thermography may represent a new method of investigation of the pavement grip factor offering two-dimensional information. pavement grip, Skid Resistance Test (SRT), infrared thermography, road, thermal signature, flashing streaks, flashing spots. Studies of accident sites have revealed that the polishing of roadstone is a major factor in skidding; for this reason the road surfaces play an important role in the maintenance of traffic safety, in highway maintenance and in road construction. The information on the roughness and its analysis are vital for the diagnosis of the road deterioration and in the setting up of appropriate maintenance measures. As an example, this information may be used in models to predict the roughness progression in order to achieve the required prediction accuracy. The tires are the contact element between the car and the road pavement. The friction between the road pavement and that portion of tire in contact is essential for the security of the traffic. The region of connection of friction between the tire and the ground, the so-called "tire-road contact area", can be reinforced by the roughness of the road surface and the tire tread geometry. The roughness of the road surface (geometrical shape of the roadway surface, peak and valleys of the surface profile) is one of the user-relevant surface properties, which are also part of the basic road project engineering. Because the driver can not see the pavement grip of the road and because this can not be perceived except under extreme conditions, a possibly homogeneous (lengthwise and crosswise) and sufficient grip of the road becomes very important. The roadway surface texture has a relevant influence on the frictional connection behaviour of the tires (transfer of forces in the tire contact area surface through friction). A good frictional connection leads to an improvement of the car's handling and thus increases traffic security (as brake distance decreases and security in curve passage increases). The effect of surface roughness and roadway material on the grasp between rubber and roadway is called "grip". In the road-structural sense, "pavement grip" defines the power transmission between the tires and the wet roadway. Contactless profile scanning through the measurement of the roadway texture (macro -, and micro texture, for ex. Laser or images profilometer). The portable Skid Resistance Tester SRT (also known as the "Pendulum Tester") gives information on the pavement grip of the examined surfaces through checking the resistance to skidding of wet road surface. This apparatus is used to measure the Polished Stone Value (PSV, which is a value of an individual aggregate, found by subjecting the aggregate to a standard polishing process and then testing the aggregate with SRT) and the Skid Resistance Value (SRV, which is the value obtained from the actual road surface, measured using the SRT). 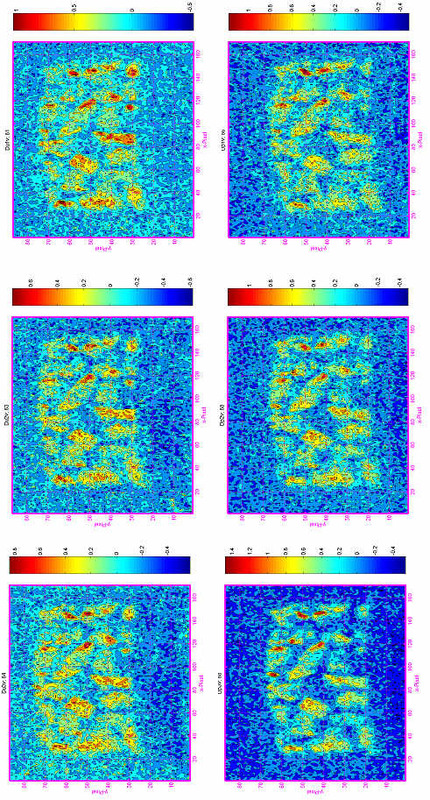 This method provides a measure of the frictional property, and the microtexture of surfaces, either in the field or in the laboratory. 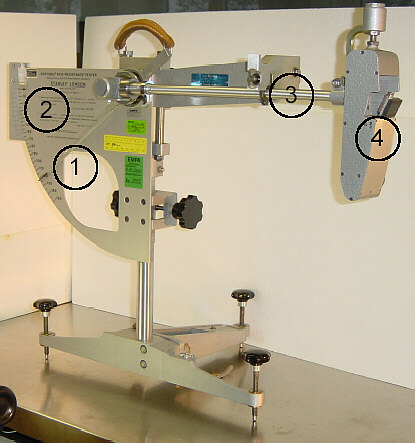 The measurement of the frictional resistance occurs between a rubber slider (mounted at the end of a pendulum arm) and the surface of the specimen (piece to be inspected). 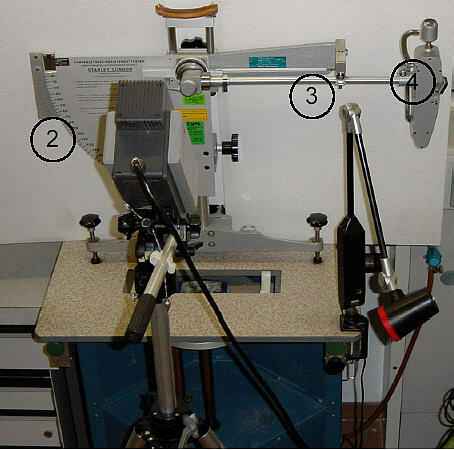 A preliminary experiment was performed to assess if it is feasible to measure with the IR-camera the increment of temperature generated by the friction during this test. Under these premises, the measurements with the SRT were limited to 3 for each specimen and were carried out at the surface (polished and unpolished). This investigation can be considered as a starting point for a possible more in-depth study to assess the methods used to determine the pavement grip. Such an assessment may allow side to side comparison of SRT with dynamic measuring methods. The dynamic energy of the rubber slider is transformed into thermal energy whenever friction occurs. The frictional heating, from the sliding contact, is responsible for the temperature elevation DT (temperature rise) at the contact interface of sliding systems (contact patch). The SRT apparatus consists of a mobile (pendulum) and a fixed part (specimen, stationary body). The specimen is heated by the moving pendulum, which acts as a moving heat source. A moving source is analogous to a flash (strong pulse in a short time), whereby the effect of temperature elevation vanishes with the time. PF = m N v (Equation 1). The generated frictional heat in the interface is F = PF and increases with the friction coefficient m, N and v.
In the median position of the pendulum there are the following values: N = 22.2N (centre of gravity 410 ± 5 mm, mass of pendulum arm 1.50 ± 0.03 kg)  and v = 2.836m s-1 "10 km h-1. Heat is generated at the interface due to the friction and is conducted into the two contiguous bodies rubber slider and specimen. After the passage of the rubber, the slider and the outside of the contact area loose heat by convection. Fig 1: SRT apparatus and IR-camera. Fig 2: SRT apparatus. Rubber slider (31.75 x 25.40 mm2). From Figures 1 and 2 it can be deducted that the swing direction of the pendulum (sliding direction) is from right to left. Therefore all the figures follow this orientation. The Skid Resistance Tester operates thanks to a pendulum with a rubber slider, which bounces from a fixed height and sharpens with an edge over a fixed length of the road surface. The energy converted by the sliding procedure is determined on the basis of the climbing height of the pendulum and results in a measure for the pavement grip of the examined surface . The infrared thermography method is employed for the measurement of the surface temperature distribution (two-dimensional) on the stationary specimen. Thermal images are taken with the IR-camera during the measurement with the SRT. The infrared measurement system consists of an infrared camera (IR-camera) AGEMA THV 900 LW (Long Wave, of 8 to 12 mm) with lens 20° x 10°. Each specimen consisted of 42 ± 5 stone aggregates embedded in plastic, which were arranged very closely to fill out as densely as possible a surface of 90.6 x 44.5 mm. The surface of the specimens was even in the transverse direction and exhibited a curvature of 406 mm in diameter in the longitudinal direction (sliding direction) . The inner part of the epoxy resin specimen is covered with a black electrical tape because in the infrared this material shows a semi-transparent behaviour. The measurements were carried out on the unpolished and polished surface. Measurements resulted in the Skid Resistance Value (SRV), the Polished Stone Value (PSV) and thermograms. 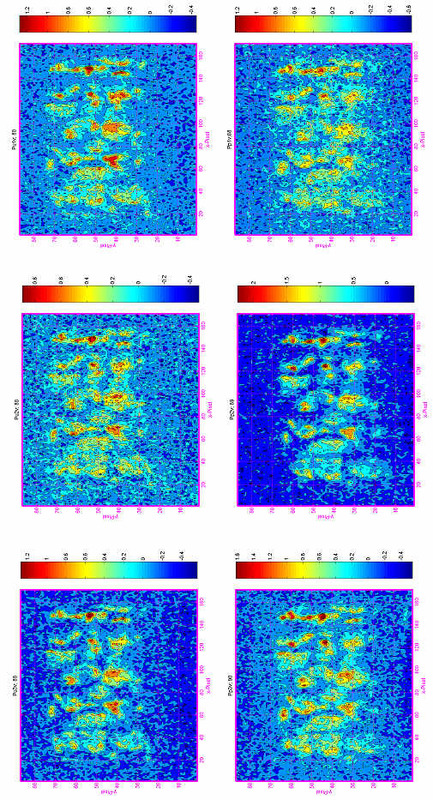 The technique of image subtraction was employed: a sequence of thermal images was taken before release of the pendulum, then the average of the sequence (temporal averaging) was calculated and subtracted to the first thermal image after the transit of the pendulum (this time difference corresponds Dt = 160...220 ms). The evaluation is based on a two-dimensional transient temperature distribution of the friction interface. The test results for the temperature rises are summarised in the attachment. The test results of the SRT test are presented below in Table 1. Table 1: Test results of SRT test (SRV and PSV). It should be noted that the direction of x-Pixel corresponds to the direction of the pendulum, which swings from right to left. T3: effect of the contact pressure distribution. The T1 zone represents the noise of temperature and is more or less distributed along the sliding direction (the x-axis) in a interval comprised between -0.5°... +0.5°C. The T2 zone represents an area in which DT appears to be more or less regular. From Equation 1 it can be empirically deduced that this phenomenon is due to the normal force (constant pressure). It is assumed that the normal force is constant (22.2 N) along the entire sliding direction. In the T3 zone the effect of the variations of the contact pressure distribution show up. These variations are caused by the spring mounted on the rubber slider (Figure 2) and by the volume deformation of the rubber (Figure 4, red circle) (the rubber clings to the profile of the specimen and at the same time the rubber stores energy). Fig 4: First contact between rubber slider and surface of specimen . Fig 5: subsequent contact . In the course of the temperature elevation the typical damped path of freely absorbed oscillation is recognisable. 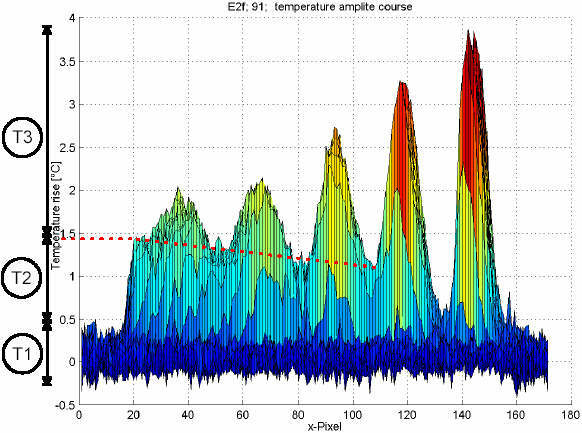 The temperature elevation amplitude shows a dampened course. The contact occurs in the first zone, where the highest temperature is found. Between the first and the second zone there is an area where the temperature rises by approximately 0.5°C. In this zone there is no contact between the specimen and rubber slider (correlation between conversion of dynamic energy into thermal energy). Subsequently there is contact between the two parts and the pressure exercised on the surfaces in contact varies (contact pressure distribution). In the right column of Table 3 we recognise the same situation described previously with Figure 4, namely the 5 flashing streaks zones. Temperature amplitude course for epoxy resin. The distribution of the temperature rise DT inside the flashing streaks zones along the y-axis is irregular. When comparing the geometry of the specimen in the same direction, it can be seen that the profile presents no marked roughness or sinking (Table 7). Therefore, it is the surface of the rubber slider that is irregular and thus does not supply a homogenous and constant contact with the specimen (effect of the contact pressure distribution). 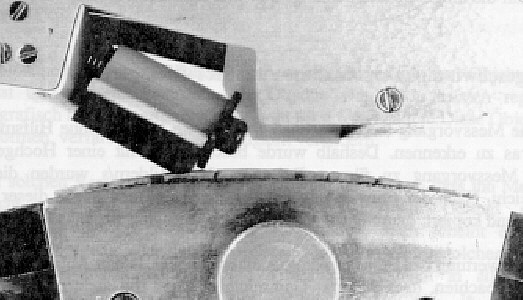 Through a visual analysis of the rubber slider a deterioration of the edge and the surface part that come in contact with the specimen were noted. Table 7: Temperature amplitude course for epoxy resin. The specimens diabase, limestone and porphyry show flashing spots of the temperature rises (thermal signature). The positions of the flashing spots coincide with the 5 zones characterised for the flashing streaks. The formation of this typical thermal signature may be explained by the fact that the rubber slider is in contact only with the asperities of the specimen surface (peaks), which appear like flashing spots, and by the effect of the variation of the contact pressure distribution. 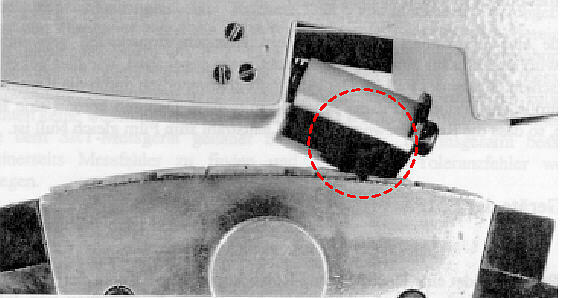 Figures 4 (red circle) and 5 (pictures taken with a high-speed film camera ) demonstrate that the surfaces in contact do not remain constant during the movement of the pendulum, and the elastic deformation of the rubber slider. It can be observed that the rubber slider itself does not move with constant pressure over the entire topside of the specimen (brake distance). Theoretically, the pavement grip factor is a coefficient, which considers all determining parameters and influences and is the most frequently applied measuring methods to determine the pavement grip of the roadway surface. Supposedly the pavement grip is defined by one coefficient, which considers all determining parameters and influences. The pendulum with the rubber slider glides over the topside of the specimen. The rubber slider is fastened to a springy supporting device. At the first contact between the rubber slider and the topside of the specimen there is an important pressure force (i.e., higher temperature difference according to the Equation 1) in the contact area. Thereafter, the rubber slider nearly lifts-off (avoidance of the pressure force and/or the temperature difference) and is then again slightly pressed-in, and so on. The IR-camera allows to visually perceiving the pavement grip and attempts to extract two-dimensional information about the contact surface. The temperature rise D T supplies information on the distribution and intensity of the pressure in the contact area. The combination of the SRT with the IR-thermography method may represent a new method of investigation of the pavement grip factor offering the visualisation of surface irregularities as in rough surfaces the contact happens only at the asperities. When considering the lowland speed of the pendulum (10 km h-1), it may be considered to employ this measurement system also in the development of the footwear sole of safety shoes or in the choice of the type of paving for pedestrian zones or floor covering in the buildings. Fischlein H; Untersuchung des Fahrbahnoberflächeneinflusses auf das Kraftschlussverhalten von Pkw-Reifen; Fortschr.-Ber. VDI, Reihe 12 Nr. 414. Düsseldorf: VDI Verlag 2000. Xie, Ch. ; Experimentelle Untersuchungen zur Interaktion zwischen Pkw-Reifen und Fahrbahn beim Bremsen; Fortschr.-Ber. VDI, Reihe 12 Nr. 486. Düsseldorf: VDI Verlag 2002. Eichhorn U; Reibwert zwischen Reifen und Fahrbahn-Einflussgrössen und Erkennung Fortschr.-Ber. VDI, Reihe 12 Nr. 222. Düsseldorf: VDI Verlag 1994. Nondestructive Testing Handbook, Vol. 3; Infrared and Thermal Testing; Maldague X.P.V. ; Moore P.O. ; American Society for Nondestructive Testing 2001. 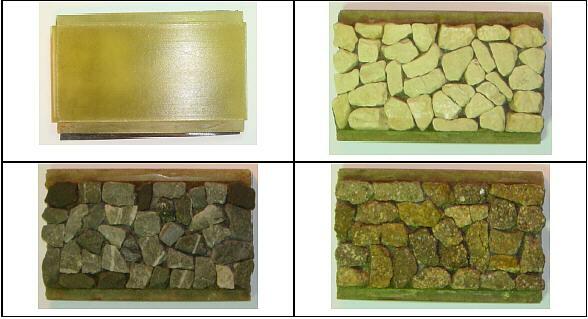 European standard; EN 1097-8; Tests for mechanical and physical properties of aggregates- Part 8: Determination of the polished stone value; CEN, December 1999. Humm W, Junker J, Neubauer O; Polierwiderstand von Mineralstoffen, Polished Stone Value PSV; Eidg. Verkehrs- und Energiewirtschaftsdep., Bern Forschungsauftrag 10/86; Dezember 1989. Neubauer O; Polierverhalten von Mineralstoffen; Eidg. Verkehrs- und Energiewirtscahftsdep., Bern Forschungsauftrag 8/90; Juni 1995. 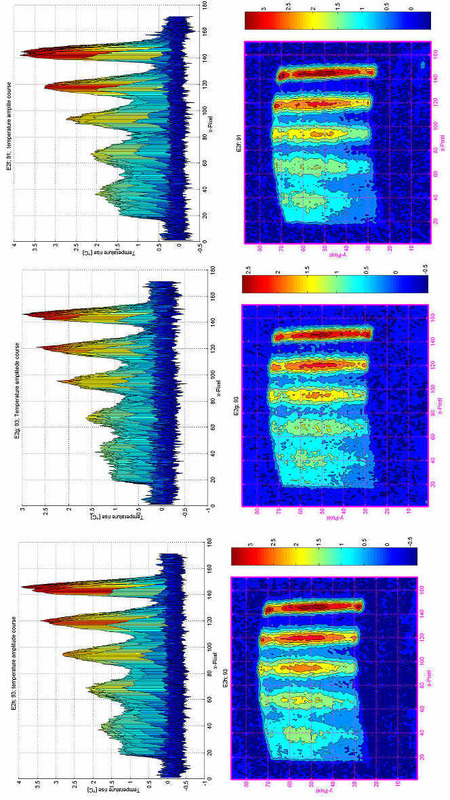 Divinsky M, Nesichi S, Livneh M; Development of a Road Roughness Profile Delineation Procedure; Journal of Testing and Evaluation, Vol. 25, Number 4; ASTM JULY 1997.